NDP Leader Jagmeet Singh is challenging the federal government to pick up the tab on Ontario’s recently cancelled basic income pilot project. 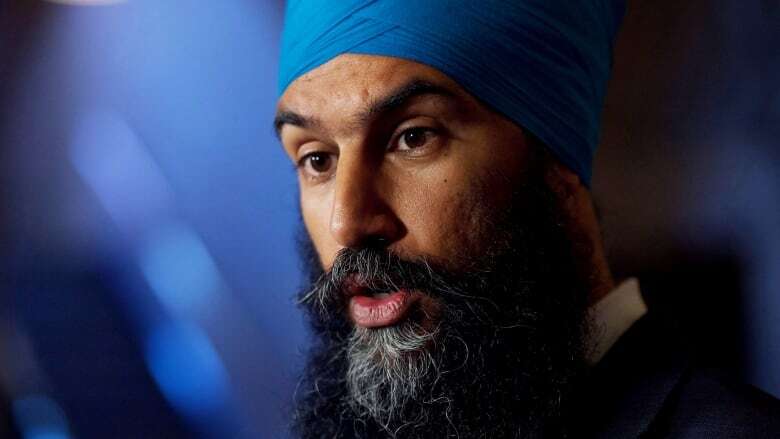 NDP Leader Jagmeet Singh is calling on the federal government to pick up the tab on Ontario's recently cancelled basic income pilot project. "Strong government leadership is required to address the challenges of our changing economic landscape. That's why I'd like to take this opportunity today to call on the federal government to step in and fund the remainder of the basic income pilot project," said Singh during a speech to the Council of Canadian Innovators in Ottawa Tuesday. "It's morally very reprehensible to have people sign up for a project for three years and to then be stripped of their project prematurely. People make plans, they make life decisions around knowing what's going to happen." The project was launched under the previous provincial Liberal government in 2017 and was set to run for three years, providing payments to 4,000 low-income people in a handful of communities, including Hamilton, Brantford, Thunder Bay and Lindsay, Ont. Its aim was to explore the effectiveness of providing a basic income to those living on low incomes, whether they are working or not. Single participants received up to $16,989 a year, while couples received up to $24,027, less 50 per cent of any earned income. The Tories had promised during the spring provincial election to preserve the $150 million pilot, but Social Services Minister Lisa MacLeod later said the new government would reverse course because the program was failing. "[There's] the decision in the campaign and then you find the realities of when you're in government," MacLeod said back in August. The Progressive Conservative government announced participants will receive their final payment in March 2019. Singh said continuing the pilot would provide invaluable data that could help design future basic income programs. "The pilot project will provide us with important information on how basic income works and how it could work in a modern context," he said. Singh's request comes after the mayors of Hamilton, Brantford, Kawartha Lakes and Thunder Bay sent a letter to federal Families, Children and Social Development Minister Jean-Yves Duclos last month asking Ottawa to "assume oversight" and pay for the remainder of the program. Last week, 100 Canadian CEOs — some of them members of the Council of Canadian Innovators — sent a letter to Ford urging him to save the pilot project. "It is time we recognized that structural changes in the economy are occurring that make obsolete basic income related left vs. right views on welfare reform and laziness," says the letter co-written by Floyd Marinescu, CEO of C4Media Inc., and Paul Vallée, CEO of Pythian Inc.
"If the Ford government truly believes that basic income will discourage work, then you should allow the pilot program to continue so you can have data on your side."